UNAWARE: Results from the Clear Channel ‘Look Again’ report. Click to enlarge. 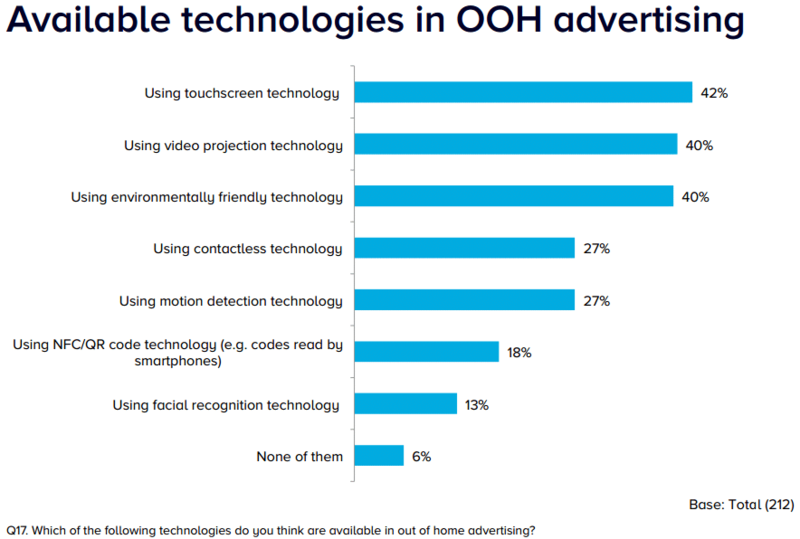 Only 18% of marketers are aware that out-of-home (OOH) advertising campaigns can make use of NFC and QR codes, survey data from Clear Channel UK reveals, despite them citing ‘innovation’ as one of their top buying considerations when under pressure to find new ways to reach mass audiences. 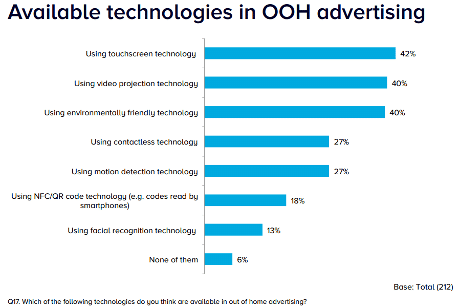 The ‘Look Again’ report, based on the responses of 200 marketing professionals, also found a low level of awareness of the application in OOH advertising of technologies including contactless payments (27%), motion detection technology (27%) and facial recognition (13%). Touchscreen technology saw the highest awareness (42%), followed by environmentally friendly technology (40%) and video projection technology (40%). Some 6% of those surveyed were unaware of any of the technologies. “We are at the point where many marketing professionals’ perceptions are at odds with the new levels of digital sophistication across the OOH medium,” says Clear Channel UK CMO Sarah Speake. Clear Channel first showed its interest in NFC for OOH advertising in 2011 and after trials in many international markets went on to launch its Connect interactive advertising platform in the US and Canada in July 2014 as a way for brands to add NFC, QR code and SMS-based mobile interactivity to their ads. The system is now deployed in 23 countries around the world.